To catch a fish like this in the Eagle River in Southern Labrador in Newfoundland Labrador, Canada is a common event as many fisherman pull out large healthy Atlantic Salmon while staying at the Rifflin'Hitch Lodge. 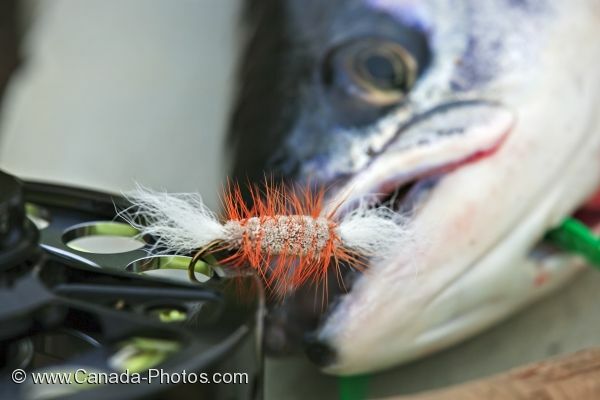 This photo gives you a good look at the eye of the Atlantic Salmon and what type of lure was used to catch this fish. Atlantic Salmon and fishing gear at the the Rifflin'Hitch Lodge, Southern Labrador, Labrador, Newfoundland Labrador, Canada. Picture of the eye of a fish looking up at you after being hooked by this lure in the Eagle River of Southern Labrador, Canada.